When creating your presentation, poster or infographic, the most important part is your information. Visual communication is just organizing your information so it is easily read, easily comprehended and easily retained. The best way to know how to do that is to understand visual thinking-- how a person's brain looks at and interprets information. On VisualMess.com, Daniel Higginbotham best describes the difference design can make using this example. 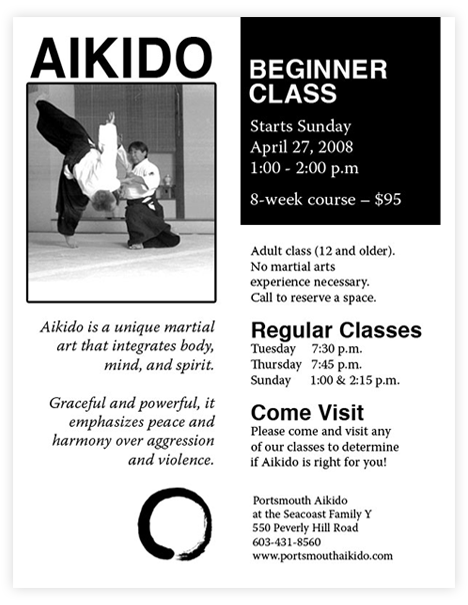 Here are two flyers for an Aikido course, all with the same information-- but one is easier to read, comprehend and retain. That is what we mean when using the term "clean". Because the flyer on the right is cleaner, there is less effort on the part of the reader to consume the information. Organizing the information cleanly to fit our brain's assumptions is what makes it easier to digest. Visual thinking is not slow, logic thought but immediate. Clean design supports visual thinking so your audience absorbs the information necessary with the least amount of effort. For example, billboards are designed only with visual thinking in mind because a person only has a few seconds to glance and consume all the information that billboard is providing. Retrieving buried details. 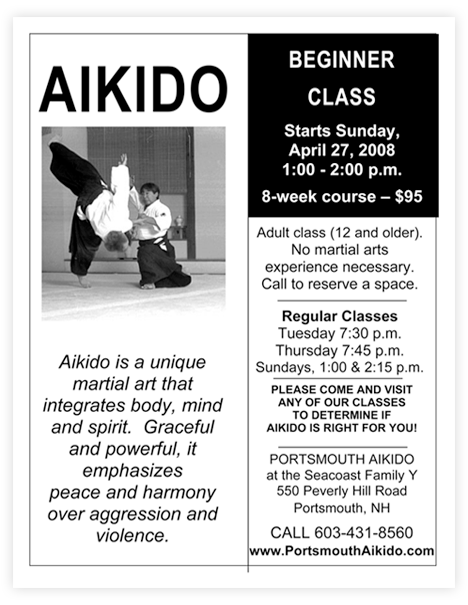 I remember something about an Akido class... where was that? What's is this poster about? It's about mobile apps. How interesting! What research did they do with apps? That app usage can help facilitate learning, wow. What was the conclusion to their research? My goodness, app usage is growing and becoming a necessity! (Later, after the conference) I'm going to look into mobile apps and how we can employ them. Remember: you're not making this poster or infographic for you-- you're making it for your audience. Information is conveyed by the relationship of each element to the others around it. The header, boxes, font, text size and colors all have to communicate together. This will look fantastic if the visual relationships are obvious and clean, but when they are not in sync, the result will look cluttered and confusing. If your audience has to examine your work more carefully to fully get the information, going back and forth to try and make connections, then you've lost them. When you're creating a visual document, you want to eliminate any mental conflicts between what you are trying to say and what your document's layout is saying. The main problems with bad design is slight, unintentional differences among each of the elements within the document. This causes your brain's visual processing to hiccup. As Higginbotham points out, "First, your brain has to determine if there actually is a visual difference. Then, it has to determine the significance of that difference. Because the small discrepancies don't actually signify anything, you end up wasting your audience's brainpower."